Men's Military Style White Short Sleeve Shirt 2 Pockets, "Military White"
Ketut Suwitra evokes military-style elegance for the design of this handsome shirt for men. In crisp white cotton, the shirt features shoulder tabs and twin chest pockets with buttoned flaps. 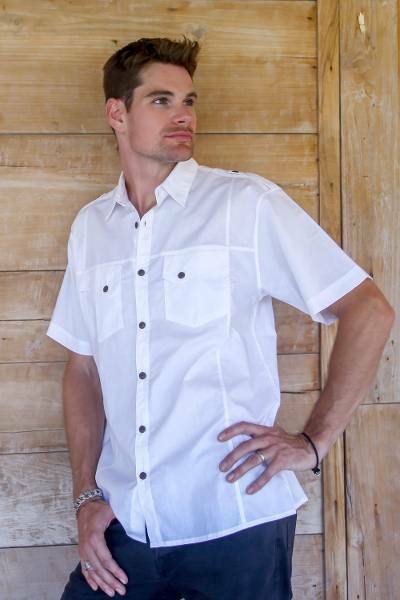 The short sleeve shirt fastens with coconut shell buttons. You can find men's cotton shirt 'Military White' by Ketut Suwitra in clothing categories such as Cotton Shirts. Enjoy exploring these sections for other Novica treasures. Ketut Suwitra has received a $1000 microcredit loan with 0% interest. Proceeds were used to purchase fabric in bulk. I love this tunic! It is just long enough. The colors are wonderful. It is light weight. Simple classic style! I ordered and received the robe 'Bali Weave in Blue' and I must say, I absolutely ADORE it! The fabric is so soft and comfortable, it feels so much better than the department store robes I already have. The sizing is good, even though I am 5'11"" I feel like it is a good length for me. The pattern is so unique and quite eye-catching without being gaudy in any way, and the cornflower blue hue is very pleasing to gaze upon. This is my new favorite robe, thank you! !